Comfort food for the new chill. An autumn/winter replacement for the Italian classic–Parmigiana Melanzane. It was last night’s supper, with a slice of sweet potato and some baba ganoush. We are trying to eat more lightly in the evening and mainly vegetarian–New Directions, I’m calling it. 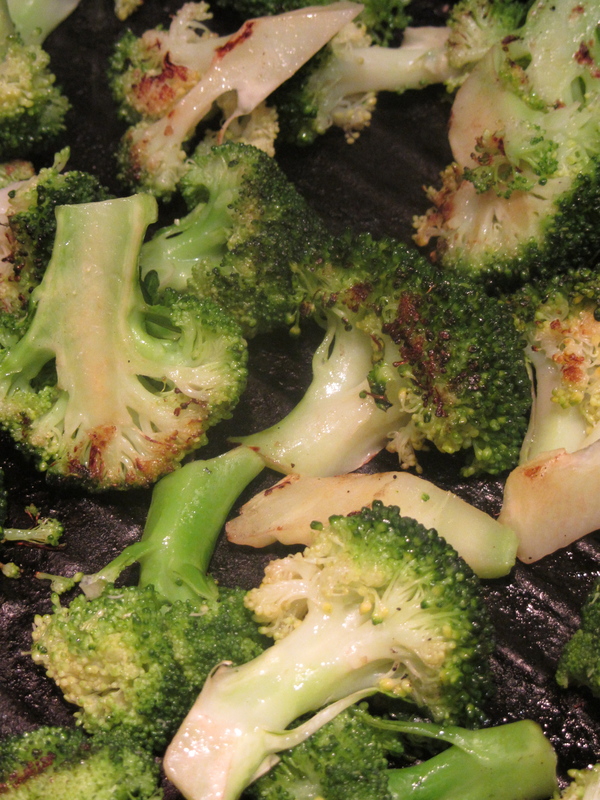 Steam the broccoli florets until they are beginning to soften–but retain a good crunchiness. Put them in a bowl and pour over two tablespoons of olive oil and season. Heat a grill pad to hot. Char the the florets lightly and remove. Oil a shallow oven proof dish and spread some tomato sauce over the base. Cover this with a layer of broccoli florets and season with salt and pepper. Repeat the process finishing with a layer of parmesan. Dribble olive oil over the top. Pop in the dish and bake for 15 minutes. It should come out sizzling! Cook on a high heat, stirring frequently to prevent burning, and watch out for splattering! Cooking time is about 20 minutes. The sauce will have reduced considerably and thickened, with very little liquid left. Thank you! The very ingredients that I acquired today. South-west France and northern Poland seem to agree surprisingly well on seasonal produce. Awesome, I’ll try this healthy dish! Robin, this is great! Great Italian flavor without the pasta that I can’t handle. This one goes into my file, for sure. Keep ’em comin’, sir. 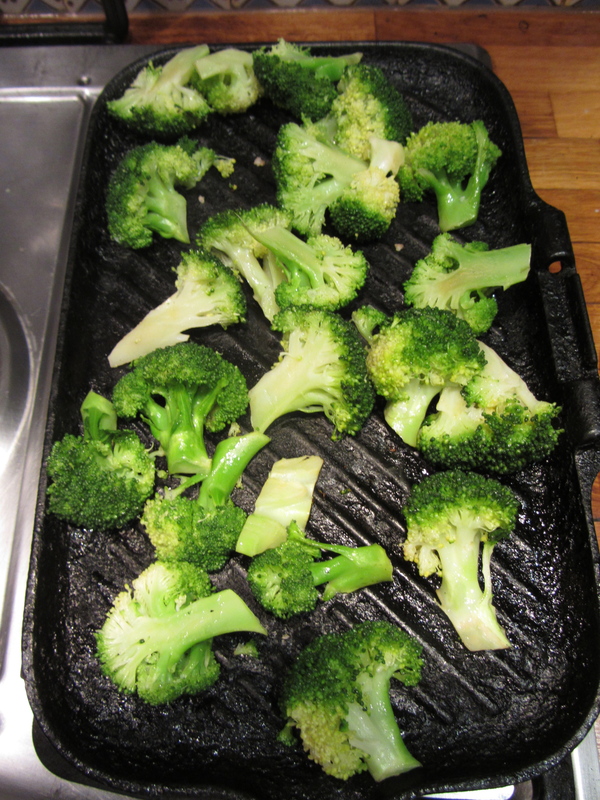 never tried this with broccoli before. looks great. been a vegetarian since 1972 so keep the vege dishes coming. 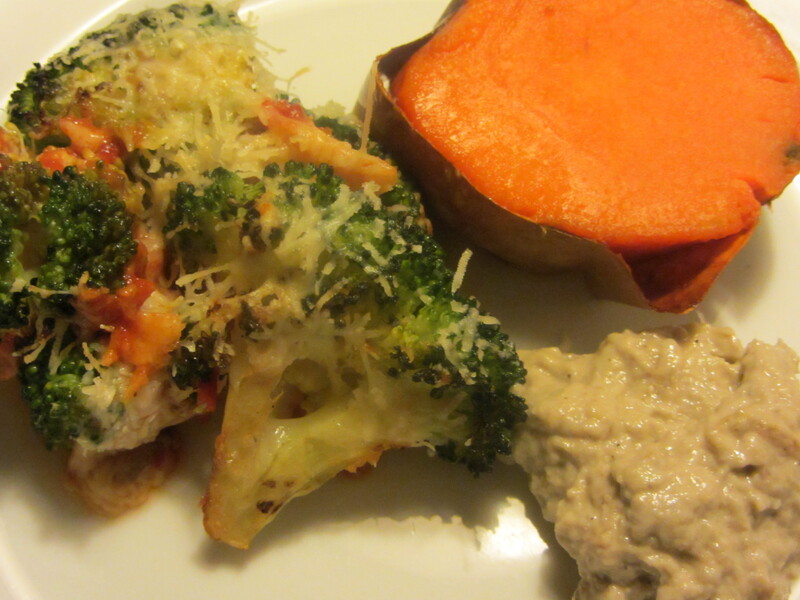 Looks delicious –and I am excited that you are doing more vegetarian cooking. Keep it coming! on October 11, 2012 at 11:08 am | Reply Dianne P.
Go easy on the schedule, Dianne–weekend coming up. Hi Robin and Meredith, I’d like to thank you for this blog! Although I’ve been married to a wonderful chef for 26 years, I’ve never been interested in cooking until this year. What got me reading this blog is that my husband has diabetes, and also that I’ve been a longtime fan of Poldark. What has kept me reading this blog are the recipes and photos (and the posts about the cats). So far, the aubergine rounds are my favorite to make, and they are a hit with my family. Last night, I actually made dinner for my husband and brother-in-law. So thank you for getting me in the kitchen and cooking! I can’t believe how much I’ve been enjoying it! Thank you, Anne and congratulations! Cooking can be fun and I bet your husband’s happy not to be in the kitchen for once. Giggling watching you in Fawlty Towers – had to do a double take!!! Nice jacket!!!!!! Thanks–it holds up after all these years–JC was/is a comic genius. Jacket?–bit iffy!–which was spot on. Oh my heavens, I never get tired of Fawlty Towers and have introduced it to my kids so that the genius will continue to be appreciated and enjoyed. And I was always tickled that Poldark had an episode, too. 🙂 And let’s be clear on this: It was a way cool jacket! That jacket was awesome! I’ve been trying to find one similar for ages, any idea of the make? (if at all?) In fact i’ve just watched that episode with you wearing it literally 5 mins ago and thought “i’m going to google that jacket” and found this site! Did they let you have the jacket Robin? 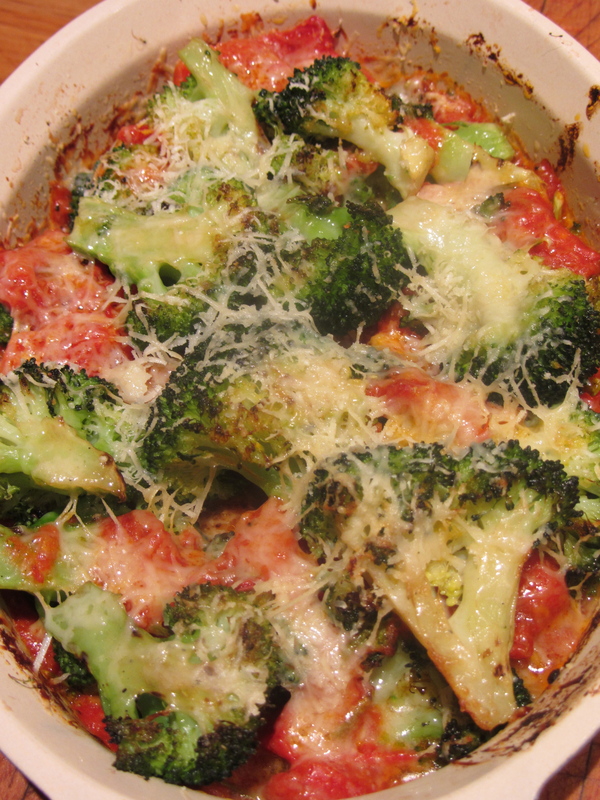 Great way to do broccoli by the way, will try that for Sunday! I don’t think so, Nick. The jacket disappeared not surprisingly between the series. 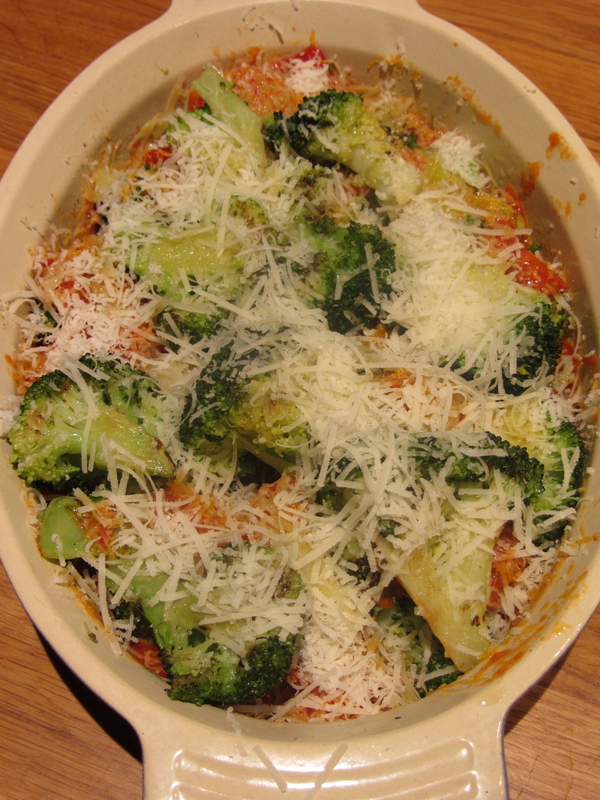 Trying this on Sunday….but will add sliced tomatoes as well….My girls will love it, i am sure. Hi Betsy–good to hear from you. Thanks for reminding me about this–broccoli is beginning to show up in the markets now. It’ll be on the menu in a tick. Wrap up warm and very best wishes to you and Bob.